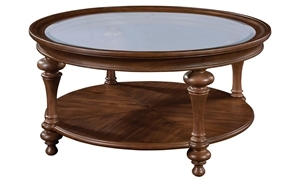 42-inch round wood cocktail table showcases a tempered glass top surface, striking turned legs and lower shelf for storage or display. 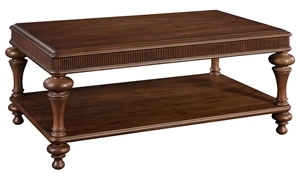 Rectangle cocktail table in a warm brown multi-step finish showcases eye-catching turned legs and an elegant reeded apron. 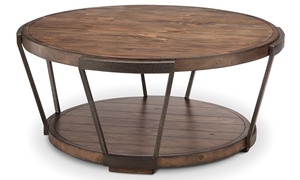 Stunning industrial cocktail table features distressed round wood surfaces supported by a metal frame in an aged iron finish. 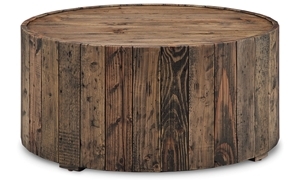 34-inch round table crafted from reclaimed wood in a weathered and distressed pine finish makes the perfect rustic centerpiece. 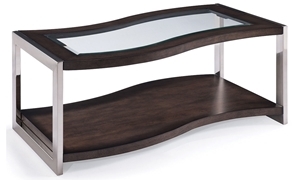 Contemporary piece makes mixed media look effortless with angular metal legs supporting curved wood surfaces and an inset glass top. 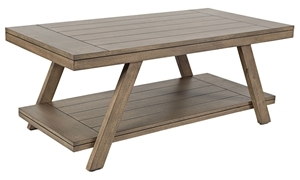 Pine cocktail table in a warm coffee finish creates a bungalow vibe with its plank-style lift top, rattan baskets and turned bun feet. 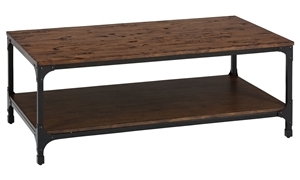 Simple, rustic design in pine solids and veneers showcases a plank top and bottom shelf between block legs in a weathered finish. 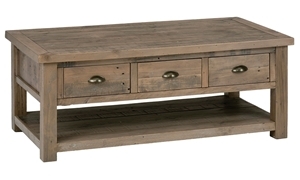 Rustic cocktail table crafted from distressed acacia features three pull-through drawers with whitewashed fronts for a vintage look. 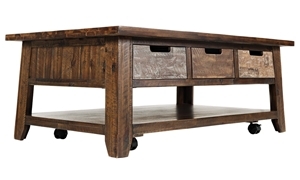 Cocktail table combines natural and industrial elements in one trendy design with its riveted steel frame and distressed pine surfaces. 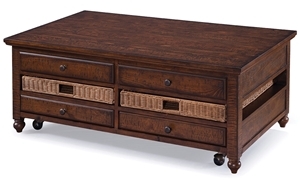 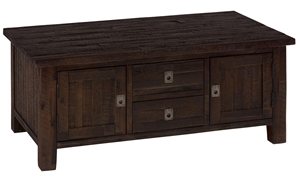 Ample, easily accessible storage makes this cocktail table crafted from dark, distressed acacia a tropical treasure for your living room. 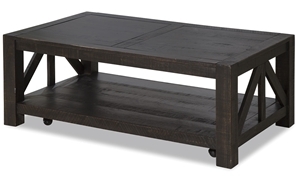 Whether you call it a Cocktail Table or Coffee Table, whether you prefer somthing sleek or something more classically inspired, Haynes has everything you need to create a wonderful living space, including amazing Cocktail Tables in every design style.